I, and many others, are celebrating the 100th anniversary of the famous "solar dance" that occurred in Fatima (Portugal) before thousands of astonished people. For decades, many researchers have been convinced that the strange phenomena narrated by the three humble Portuguese shepherds can be included within the UFO paradigm. For these researchers there is no doubt that Fatima's Marian apparition was really a close encounter with an "extraterrestrial" ship misunderstood by a group of children who could scarcely even imagine the transcendence of their visions and that, in addition, for greater confusion, it was concealed and silenced by the Church, which presented before public opinion a sweetened image (read religious) of what had happened in that remote Portuguese region. And it is the updated review of the facts, with UFO casuistry in hand, allowed many ufologists to reinterpret the events of 1917 as the vision of a humanoid associated with unknown aerial phenomena (UFOs). In addition, for greater certainty of his thoughts, the "dance of the sun" concealed the flight of a silver "disc" that frightened the good people unable to decipher what was presented before their noses. However, I think it is a great mistake to believe that the UFO phenomenon encompasses the Marian apparitions and not the other way around. In fact, from my perspective, no anomalous paradigm prevails over another. 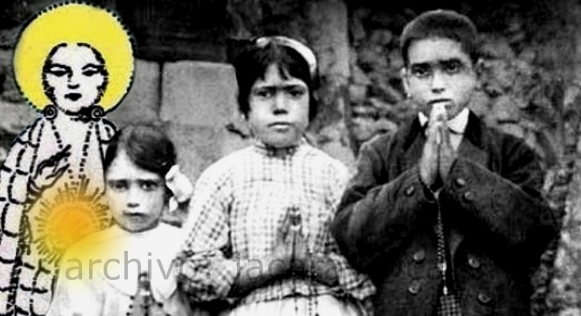 What happened in Fatima is not synonymous, far from it, with an underground ufological episode. We are simply faced with the manifestation of an unknown phenomenon of psychic origin, which was transmuted as the witnesses themselves began to influence their interpretation. And only the combined faith of thousands of people, that is, the strong popular belief in these apparitions made possible the miracle of the Sun.